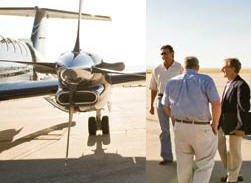 September 15, 2009, Washington, DC, National Business Aviation Association (NBAA) today unveiled a new resource to help Members comply with Customs and Border Protection (CBP) Advance Passenger Information System (APIS) requirements. The Association has partnered with ARINC Direct Business Aviation Solutions to offer this tool exclusively to NBAA Member Companies. CBP requires all general aviation and commercial aircraft to provide passenger manifest and aircraft information prior to departure for all international flights to or from the United States. All crew, passenger and aircraft information is stored on secure ARINC servers for use in future transmissions. Users have access to real-time CBP approval of all APIS transmissions Members have access to technical support 24 hours per day, seven days per week. Members can make APIS transmissions for flights operated under both Part 91 and Part 135 of the Federal Aviation Regulations. ARINC Direct Business Aviation Solutions is a leading provider of flight support services, such as advanced flight planning, flight following, contract fuel and international trip support. For more than 80 years, Annapolis, MD-based ARINC has been a leader in aviation technology solutions with locations in London and Singapore. Founded in 1947 and based in Washington, DC, the National Business Aviation Association (NBAA) is the leading organization for companies that rely on general aviation aircraft to help make their businesses more efficient, productive and successful. The Association represents more than 8,000 companies and provides more than 100 products and services to the business aviation community, including the NBAA Annual Meeting & Convention, the world's largest civil aviation trade show.